Collecting $10,000 in annual dividend income from a $10,000 initial investment is the holy grail of income investing. More broadly, collecting annual income equal to the amount you invest is almost always a signal of an investment well-chosen. Assuming you get there within two or three decades, it represents an extremely efficient use of capital that comes with a huge margin of safety because you can re-allocate the dividends to new investment opportunities, continually extracting the amount of money you put at risk from your labor into a business enterprise. Someone that owns any Buckeye units would be receiving current distributions of $1.1125 per quarter (units and distributions are the jargon in MLP world to express shares and dividends that we associate with typical corporations). The amount of the payout increases each quarter, so your cash payment makes you richer every three months even if you freely spend the distributions along the way. If you reinvest, the wealth-creating effects amplify. How much do they amplify? Over the past twenty years, a $10,000 investment in Buckeye Partners would have grown your share count from 575 units to 2,223 units. The price quadrupled over that time frame, which is nice, but MLPs aren’t really designed to be trading vehicles because of the tax structure. Most importantly, the annual payout has grown from $1.40 per unit to $4.45 per unit. Your annual income would be 2,223 x $4,45= $9,892. 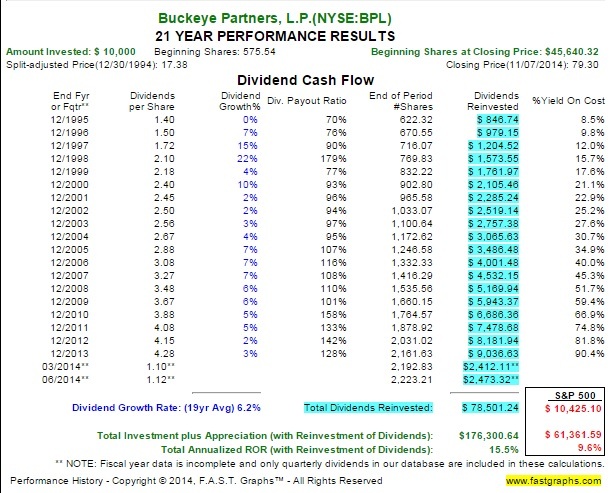 Someone who bought Buckeye Partners in 1994, and has since reinvested, will see a $10,000 investment payout over $10,000 annually sometime in 2015. That is a testament to the power of high reinvested dividends in a growing oil enterprise. What I find so interesting, and what escapes most people, is that the twenty-year growth rate in the payouts is only 6.2%. Most people who aim for prodigious income or capital appreciation set their sights on businesses growing profits at 15-20% annually. Things like Visa, which are appropriate places to search for capital appreciation. But they are not the only place. In the case of Buckeye, the 6% distribution growth powered you towards 15% annual returns because the starting yield is so high that the act of reinvesting fat payouts, again and again for years and years, leads to eye-popping results years down the line. A single $10,000 investment in 1994 could fuel your retirement with more income than you’d get from Social Security payments. It’s one of those crazy good investments setting out there, beyond notice. Alas, I do not currently own any Buckeye Partners. I had/have an outstanding buy order at $58 which has never been filled. The logic behind the buy order? You know in advanced negotiation classes, you learn about BATNA, or the best alternative to a negotiated agreement? My oil investment equivalent was this: I refrained from buying Buckeye until it could reach a point it surpassed the best oil alternative—BP stock in the $40s. After all, you have to keep in mind that energy MLPs have to distribute almost all of their net income to owners to maintain their special tax classification. There’s no magical bevy of retained earnings on hand to fund growth—firms like Buckeye have to access the capital markets and issue debt to grow (that’s why the unit count has increased from 34 million to over 130 million in the past ten years; constant dilution is inherent in the business model—what counts is that the debt and units created are invested into lucrative projects). BP is very different. It makes about $14 billion in profit and pays out about $7 billion in dividends. Seeing a yield in the 5% range from Buckeye and BP comes with very different implications; Buckeye’s 5% yield comes attached to the fact that it sends almost all the income your way. In the case of BP, half the profits are retained on hand for future growth (you see a 5% yield plus there is another 5% retained by the company to grow, making the company much more attractively IMHO). At $58, Buckeye would be paying out 7.67% (putting it back at the high end of fair value, in my opinion), and thus tolerable for purchase. It’s a pipeline that typically grants investors starting points in the 7%, 8%, or 9% range. And by typically, I mean, pre-crisis and low interest rates. Coming out of the recession, the shares have been perpetually overvalued, because it is a high-quality source of income and people want yield that is hard to find. During that October swoon, I thought I was going to get my price. It came down to the $63 or $64 range. I remember seeing it break under $64, and thought about revising my buy order upward. I didn’t, because I remembered considering the same thing when the price went below $70, $67, $65, and then under $64. I thought it was going to come down to my price. After all, when oil swoons, it swoons hard (in 2008, for example, Buckeye fell from $50 to $22 in the calendar year). Even though the long-term results for Buckeye bought at $64 will likely be very good, I’m not bumming about it too much. The high-yield asset classes are all trading out of whack compared to their historic valuations, and come with a negative margin of safety. I’d rather suffer the fate of being too picky rather than not picky enough. I wonder if BP investors twenty years from now will have a similar story to the Buckeye Partners investors that chose to reinvest. It’s so wild—BP’s market cap is over $100 billion—making it one of the six largest oil firms in the world, and yet I anticipate it will eventual be a huge source of wealth creation for those that dutifully reinvest. There will come a time when reinvesting in the $40s will be looked up fondly years from now, the same way someone might be looking back on Buckeye trading in the $20s years ago. Buckeye had a 7.5% starting yield that grew at 6.2%. BP has a 5.6% yield that might grow at 7% or 8% long-term. While not perfectly symmetrical, there are enough comparative qualities to catch my attention. I expect the yield-on-cost for someone that buys BP stock today and keeps on reinvesting will become quite substantial a generation from now.